Frank Edwin Wright III was born in Frankfurt, Germany. He lived in Willits, California with his father and his older sister, Lori. His father, a helicopter pilot in the Vietnam War, decided to move the family there to insulate them upon his return to the United States. Wright's closest neighbor was Larry Livermore, who at the time was the singer of the punk band The Lookouts. At age 12, Livermore recruited Wright to join The Lookouts and gave him the name of Tre Cool relying on both the French word très (meaning very) combined with the word cool. However, the silent "s" has been dropped in the spelling, as a play on the "third" in his name. When Green Day's drummer, John Kiffmeyer, left the band they recruited Cool to play drums. Cool decided to drop out of high school in his sophomore year. Instead, he passed an equivalency test and earned his GED, and began taking classes at a nearby community college. He had to drop out of college, however, when the demands of Green Day's touring intensified. Cool's father, who owned a small company, overhauled a bookmobile and even served as the driver on three separate tours. "I watched them go from a bunch of kids to a group of musicians with work ethic," he later recalled. "On their first tour or two, it was more of a party than anything else. I still scratch my head and say, 'How in the hell did they make it?' They used to practice in my living room here - a lot of the songs they did on Dookie. You hear it coming together, and you don't expect people are going to go out and buy it. But when it does, you just say, 'Wow that's so cool". In 1998, after Green Day won a "Moon Man" Trophy at the MTV Music Awards, Tré Cool famously scaled the Universal globe at Universal studios, but escaped with no punishment - only compliments and cheers. Cool has been the only person to ever do so. 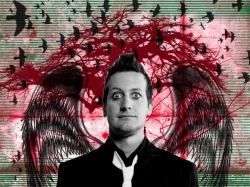 Tré was once notorious for burning his drum kit, on stage, upon completion of every set on the "Warning" tour. He has a tradition also that if he cracks a cymbal during a concert, he gives it away at the end.